Artists need funding to create work, preferably secure funding for a period so they can plan ahead, but they also need opportunities to perform it. So, it was a big welcome to the CoDance Festival (2018相遇舞蹈節), a short season of three programmes of diverse work jointly curated and staged by Sun-Shier Dance Theatre (三十舞蹈劇場) and Taipei’s Huashan 1914 Creative Park (華山1914文化創意產業園區). Saturday afternoon’s Newcomers (注目新人) programme featured four emerging choreographers. The opening Picnic (野餐) by Lin Chun-yu (林俊余), graduate of CalArts who has also spent time as an exchange student at the London Contemporary Dance School, remains as fresh as it felt when first seen at Taipei National University of the Arts (TNUA) last year. Inspired by contemporary Taiwanese poet Xia Yu’s (夏宇) eponymous work, it tells the love story of a man and a woman. Lin Fang-fang (林方方) and Yang Jia-en (楊迦恩) dance out a typical relationship, full of ups and downs, moments of playful happiness and practical jokes interspersed with arguments, fights and making up. It takes place on a green carpet, a perfect lawn but, instead of flowers, a border of black umbrellas represents raining sadness. Therein lies the poignant twist: it’s all in her memories. Wang Xiu-shan’s (汪秀珊) A Place Without You (在你不在的地方) is very much borne out of personal experience. Backed by film of the factory that was her and her late parents’ home, it is another work full of memories that are frozen in time. Dancers Kai Chen (陳楷云) and Huang Yan-ru (黃彥儒) moved reflectively as they touched on the past, its people and spaces. Yet, although danced beautifully, and perhaps because it is so personal to Wang, it didn’t reach out as I wanted it to. Four men, four chairs, four balls and a table. Welcome to Negotiate (彈判) by Chang Kuo-wei (張國韋). We talk about tossing words and ideas back and forth. Chang, Wen Qi-wei (溫其偉), Hsu Li-en (徐立恩) and Luo Li-an (羅立安) do just that, the balls that are rolled across the table or bounced between them becoming metaphors for their thoughts and speech. Very cleverly constructed, it’s full of excellent interplay, quick reactions and fast hands as the quartet negotiate their way through their encounters, friendly or argumentative. A little gem, but one that I hope Chang allows to stay as such and doesn’t get tempted to overplay. 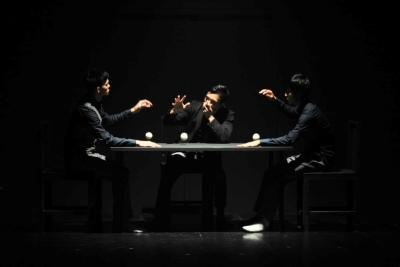 The Sacrifice of Roaring (禮祭) by Hsu Chen-wei (許程崴), who started his own company two years ago, was critically well-received when seen at the Edinburgh Fringe in 2016. The work explores the origin, process, and end of life, seeing life as a ritual but as is so often the case, an excerpt proved a little less compelling than the full piece. Even so, dancers Lin Yi-chi (林憶圻) and Lu Yung-chi (呂永圻) produced some delicious dance. The music by Lin Yi-shuo (林奕碩), played live by Wu Hsin-tse (吳欣澤), adds to the atmosphere and showed just how important live music can be, as if proof were needed. It was an excellent afternoon that engaged throughout. Now here’s a radical thought. Why not a similar programme of, say, three such ‘Taiwan Shorts’ as part of the Taiwan Season at the Edinburgh Fringe. None required major set up, all were appealing, and they certainly gave a flavour of what is happening in Taiwanese contemporary dance now. It would also open up Edinburgh to outstanding student work, such as two shown at Focus Dance Company at TNUA the same weekend. One for the Ministry of Culture to consider. Saturday evening’s Flipping the Space (翻轉空間) programme did just that, both works making quite literally full use of the entire auditorium. People (the Chinese title,《ㄨ尹口》ㄑㄩㄣˊ is problematic to translate) by Les Petites Choses Productions (小事製作) led by Yang Nai-hsuan (楊乃璇) is a fragmented work with at times more than a nod in the direction of the theatre of Pina Bausch. The audience is greeted by a man lying prone and a seemingly oblivious woman shelling nuts. Performers emerge from and use all parts of the auditorium. Among other scenes, performers are tied between two pillars so that, however hard they throw themselves, they cannot reach what they want. A man plays tennis against a wall with a frying pan for a racquet before using it as a loofah. Another, in the best recurring image, plays imaginary darts. As the song heard towards the end says, “Que sera sera.” Whereas Bausch always has a theme that weaves everything together, here such a thread is more difficult to discern. As a result, and while plenty happens and there are some interesting moments, and committed performances, the work doesn’t really hang together well as it might but with some editing it could certainly get there. The Damn Crossroads (該死的十字路口) by former Sun-Shier dancer Lin Yi-jie (林依潔) is still very much a work in progress, the completed piece due to be staged at the Xiqi Center later this year. Les Petites Choses may have used most corners of the auditorium but Lin really does flip things, having the audience sat on the stage while the dancers take over the raked seating. There is plenty of interest in the choreography, which makes full use of the eleven rows of seats and even the overhead rig. Among the best moments are a sort of game reminiscent of solitaire as some chairs are shifted and removed. Later there’s ‘make you smile’ sort of synchronised chair clearing. 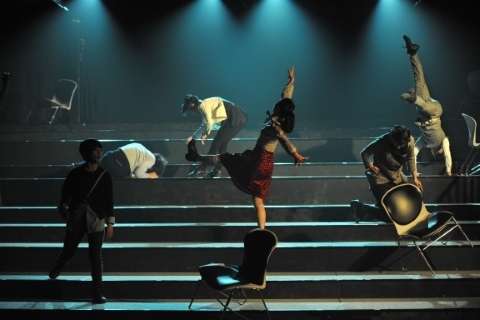 An ensemble dance with performers on different levels, what is left of the chairs at odd angles is especially good. The whole is held together well by a running theme involving a golden envelope. The cast were excellent throughout. The musical selections are eclectic to say the least. Music designer Yu Huan-fu (余奐甫) must have set some sort of record by cramming in no fewer than seventeen snippets in the half-hour or so seen. That would normally be a bit of a car crash, especially when some run right together, but this is one of the those occasions when it works. As seen, the opening feels long in comparison to the rest of the piece, though, there is a huge false ending which needs rethinking, and some of what the cast get up to, such as hanging from the rig, will not be possible at Xiqu, where there is also the issue of the seating not being anything like as steeply raked and it not being framed (by two pillars) in the way it was at Huashan. I also remember it squeaking like crazy when walked on. It is a work still in development, though. Lin still has plenty of time to edit and there was more than enough here to suggest that the final piece will be worth seeing. Completing the season, a Concerning Issues (議題關照) programme featured an excerpt from Disappearing City (消逝的城市), made in 2016 by Hsieh Pei-shan (謝佩珊) for Kaohsiung-based HPS Dance Theater, and that was inspired by the gas pipeline explosions in that city in 2015; and part of For-Get (失。去) by Chang Hui-ni (張惠妮) and Lai Szu-ying (賴思穎), from 2017, about caring for the elderly and dementia. Top marks all round to Sun-Shier and Huashan for the season. With around 150 seats (the precise number depends on the configuration), a roughly 6m x 7m stage, generally good sightlines and a great atmosphere, the Umay Theatre is an excellent venue for this sort of season and small-scale work in general too.